The Drift League (TDL) is a Formula DRIFT sanctioned Pro-Am competitive drift series hosted by MotoIQ. TDL’s objective is to help aspiring drifters prepare for the professional levels of drifting. Emphasis is given to proper vehicle preparation, mechanical & safety inspections, and how to properly run a professional level drift program. 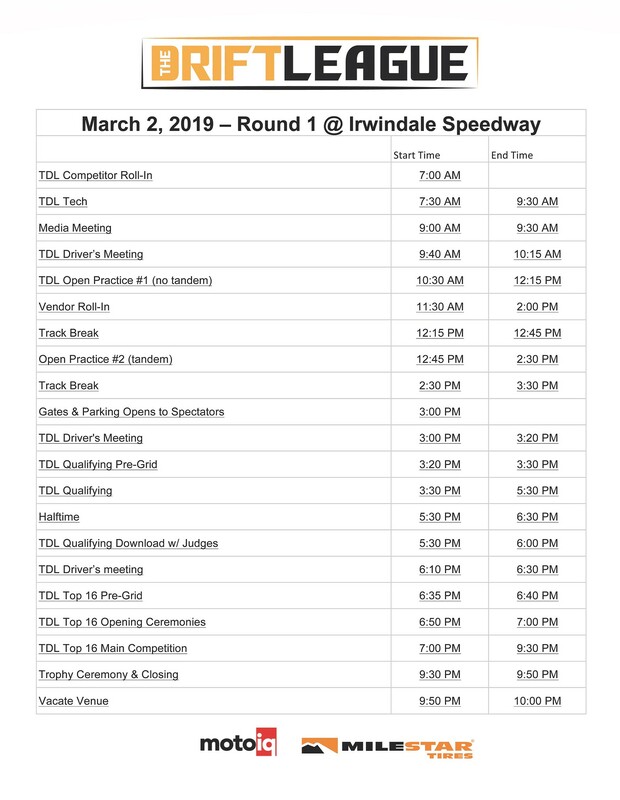 The series will consist of four single day competition events which will be held at the House of Drift, Irwindale Speedway located in Southern California. Rule sets and judging criteria will be based off current Formula DRIFT standards. Each round of competition will include practice time, qualifying and a Top 16 Competition. Course layouts for each round of competition will feature different track layouts inspired by the current Formula DRIFT competition calendar. TDL competitors will benefit from contingency programs and a cash purse at every competition. As an official Formula DRIFT Pro-Am Drift series, the top three competitors with the highest points totals at the end of the season will each be granted Formula DRIFT PRO-2 licenses.